Darcie's Pina Colada Jam - Canning Homemade! One of the most popular and sought after recipes has to be ways to make your fruity cocktail drink into a jam. Pina Colada, Strawberry Daiquiri, Strawberry Margarita, and one of my favorite requests, a Fuzzy Navel (peach schapps & Orange juice). So when I saw Darcie's post about making a Pineapple Jam and she was using Coconut flavored rum, Was it possible to make the Pina Colada into a reality? I don't drink often enough to even know that there was a coconut flavored alcohol without cream. But she did it and I was so excited for the recipe. From Darcie: "I really like the lime juice in it. It calms the sweetness down and makes it a little more interesting." Mix pineapple, orange juice, lime juice and coconut rum in large stockpot. 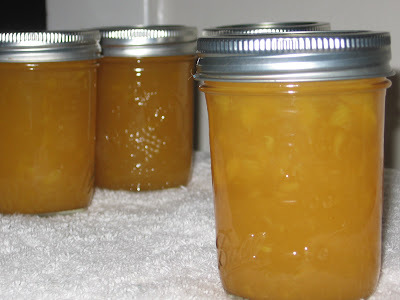 Gradually stir in pectin. Over high heat, bring to a boil that can’t be stirred down. Add sugar all at once. Stir to dissolve. Return to boil. Boil hard for one minute. Ladle into hot, sterilized jars with ¼ inch headspace. Wipe rims. Add heated lid. Screw on ring, making it finger tight. Process in boiling water bath for 10 minutes. Make 4 half pints.